Star Wars forever changed our lives. If you allow it, Yoda's wisdom can continue to affect you today. 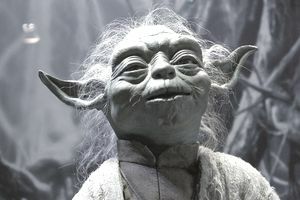 Here are ten Yoda quotes that can influence your financial decision making. Money is only as important as what it is you want to do with it. It is easy to get obsessed with having money in the bank, or with the status that comes from having nice things. Don’t let an obsession with money cause you to lose sight of deeper values; connections with people you care about, the ability to pursue new hobbies or the satisfaction that comes with helping someone else achieve success of their own. You know that if you regularly eat more calories than you burn, you will gain weight. You know that if you jump on a motorcycle with no training and never having ridden one before, you are likely to get hurt. You know that if a stranger approaches you with candy, you shouldn’t get in the car. Much common sense advice that you know applies to your money. If you spend more than you make, you will gain debt and not achieve financial success. If you jump into the stock market with no education about how it works or how to participate, you are likely to get hurt. If a stranger promises you great returns on your money with little risk, don’t invest with them. Perhaps you want to retire early, take a year off work in the middle of your career to travel, or start your own business. Yes, you want to… but you don’t really believe it is possible. If you don’t believe it, it won’t happen. Every goal can be broken down into baby steps. You then work your way through those steps to achieve the goal. Maybe the goal requires too large a sacrifice — such as giving up time with your family. In that case, keep in mind, your goal is possible, you have simply made a conscious choice that an alternative goal takes priority. Many people do not know what they can spend on a monthly basis. You can spend your take-home pay — after you have put money away toward savings. Your take home pay is what you get after any deductions from your paycheck for taxes, 401k contributions, health care, etc. If you don’t know what that number is, and you consistently spend more than that, you’ll get yourself in financial trouble. Many people commit to buying things with monthly payments - like a car, gym or club membership, new home, or new electronics — without ever checking their take-home pay and other monthly financial obligations first to see if there is enough left over for the new item. Know what you bring in, and spend accordingly. If you think you don’t make enough to save money, you’re wrong. Those committed to financial success find ways to save and pay off debt, even if they don’t make a lot of money. They may share living expenses by having a roommate, shop at Goodwill, and find other creative ways to buy the things they want for less. It is not about the size of your income — it’s about how well you manage what you have. You cannot control the decisions your employer makes, the economy, the stock market, interest rates, or many other things that the financial media reports on. Don’t waste time and energy worrying about things you can’t control. Instead, focus on the things you can control. If you are worried about a layoff then keep your resume up to date, make sure your skills are current, keep a Rolodex of industry contacts, and make sure you have an adequate emergency fund. If you are worried about the economy, then focus on saving consistently and building a long-term investment plan. The essence of control is diligently focusing on the things you can directly affect. If you are not saving enough, or not earning enough, figure out what is holding you back. Deep-seated memories can leave lingering fears about success rummaging through your brain. If you find you sabotage your own success, budgeting, or saving efforts, then seek counseling and spend time meditating to figure out what deep-seated fears are keeping you from achieving the success and financial security that you deserve. Smart investing is boring. It involves making an investment plan, consistently saving through a process called dollar cost averaging, buying into low-cost index funds, and building a diversified portfolio. It does not involve hot stock tips, penny stocks, and weekly trips to the convenience store to buy lottery tickets. Reserve adventure and excitement for your entertainment activities, not for your money decisions. I guarantee you that you have learned things about money that are not true. I’ve heard people propound all of the following mistruths about money. "The market won't do well until after the election." All of the statements above reflect an underlying belief that is not true. To be financially successful you must be willing to give up false beliefs that are holding you back. This is best done by educating yourself about money, success, budgeting, and investing. Don’t try to achieve your financial goals. Achieve them! It’s like working out. You can’t do it once or twice and expect to stay fit. It’s an ongoing process. To achieve financial success you have to commit to staying involved in your finances, looking at your budget, learning about investment options, and making adjustments as needed. What you must do is create a habit around these things. Perhaps you carve out an hour or two each month when the bank statement arrives, or a half a day once per quarter. Use this time to track financial items like how much you’ve saved, how much you’ve spent, remaining debt balances, and what your overall net worth is. Will You Be Set If You Save 10% of Your Income?